This dish was invented by our chef. Pour the vinegar in a pot and add 1 onion or 1 scallion, previously cleaned. Let boil until reduced at 1/3 of the original amount. Cut the courgettes in disc shapes and pan fry them with some olive oil, garlic, salt, pepper and chili pepper until golden. Pan fry the prawns with olive oil, time, ginger and salt for maximum 1 minute at high heat, don't overcook the prawns. Dress the dish placing the artichokes in the center forming a fan like shape, place the courgettes around them in a circular shape. 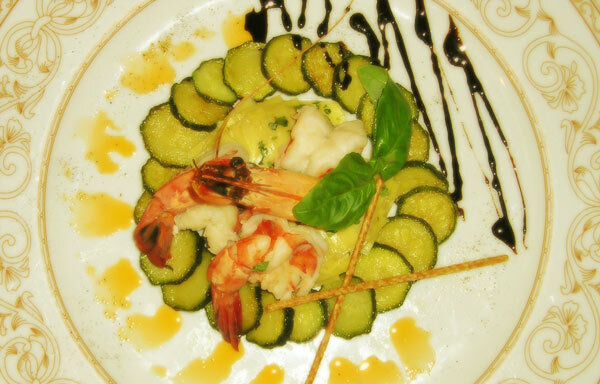 Now put the prawns on top of the artichokes and decorate the dish with the vinegar, the tomato flavored oil and some leaves of fresh basil. Sprinkle with a little ground pepper. Serve immediately.